Rising interest rates, a revamped tax structure, the potential for a massive trade war, strong economic numbers and volatility in the stock market have made for a noteworthy year in fixed income thus far. We spoke with Senior Fixed Income Analysts Craig Elder and Dave Violette on what to expect from the muni market for the remainder of 2018. Baird: When you talk about the first half of 2018, you have to talk about the Tax Cuts and Jobs Act. What impact has tax reform had on munis? First you have to remember that the new tax law eliminated tax-exempt advanced refundings, which make up roughly 25% of the bonds on the market. So that was a huge reduction in the number of bonds available this year. The new law also significantly lowered tax rates for individuals and corporations. If you’re an investor in a higher tax bracket, the fact that muni bonds were tax-free provided a compelling risk/reward. Now that tax rates have been lowered across the board, there’s less urgency to find investments that have those added tax benefits. It made the muni bond–corporate bond comparison a little tighter. In addition to retail, after the tax law change, banks went from a 35% marginal tax bracket to a 21% marginal tax bracket. This has reduced the attractiveness of municipal bonds for banks, but it is our understanding that bank loan activity has increased, which also reduces their appetite for municipal bonds. So when banks make their tax benefit calculations, they feel they can do better investing in other securities and making loans. When looking at Federal Reserve data, what stands out is that bank holdings of municipal bonds are down by $15.8 billion from the fourth quarter of 2017 to the first quarter of 2018. As a side note, the data also indicates that the shift in ownership by individual households is away from individual bonds (down more than $44 billion in the past year). However, they have not left the municipal market, as they have instead purchased them through mutual bonds and ETFs (up more than $46 billion). Baird: Is there still a demand for munis? The demand is there still – when you look at the fund flows, they've been fairly positive all year. Also, remember that in general, yields available in Europe are significantly lower than those in the U.S., with some still in negative territory. Even though U.S. municipals may have very low yields and have lost some tax benefits, overseas investors can still get positive yields in U.S. munis. So the demand is there – it’s just the supply that isn’t..
It’s also worth remembering that muni rates are based on Treasurys. Right now you've got the German ten-year at 0.29%, the U.K. ten-year at 1.24%, France at 0.64% and Japan at all of 0.03%. So by comparison, our 2.84% for 10-year Treasury bonds looks pretty good. So there’s global demand for our ten-year bonds. Baird: Beyond tax reform, what other factors are impacting the municipal market right now? Domestically, the Fed has started hiking interest rates. Rate hikes are felt most on the short end of the yield curve – bonds that mature in less than a year, typically. 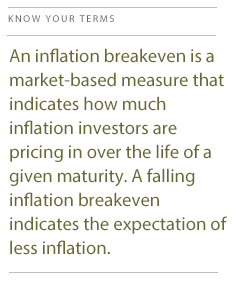 On longer end of the curve, longer-dated inflation breakevens, as compared to real yields, have risen less, indicating the market’s concern for long-term inflationary pressures is well contained. So when the curve rises on the short end and doesn’t keep pace on the long end, you get what’s known as a flattened yield curve, which we have experienced for most of 2018. In fact, in the first week of July, the yield spread between the 2-year and 10-year Treasury note fell to the lowest level since 2007. When short-term rates become higher than longer-term rates, the yield curve begins to invert. Baird: Isn’t a flat or inverted yield curve an indicator of a recession? It’s probably more accurate to say that the conditions that cause the yield curve to invert are also those that cause a recession. But yes, since 1970, all five recessions have been predated by an inverted yield curve. That doesn’t mean we’re necessarily headed for a recession – it’s just something to watch. Baird: As expected, the Fed has raised rates two times this year after their March and June meeting attributing the hikes to stronger employment numbers, stronger economic numbers and inflation nearing its target rate. How many more rate increases do you anticipate this year? 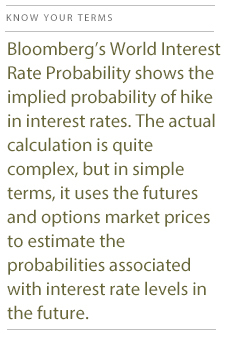 Right now, Bloomberg WIRP forecast puts an 88% probability on one more hike and a 50% probability on two more hikes. The fourth hike was primarily due to a change in one Fed member’s dot plot that was released in their June meeting notes. That could be a different story in September or December. 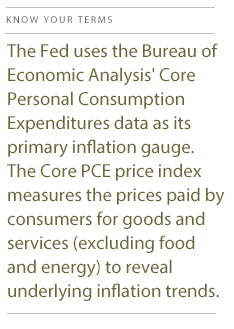 The Fed’s stated goals are full employment and price containment, or maintaining inflation. They certainly have achieved their goal for employment, and inflation is slowly moving toward their inflation goal as well. Most of the people I’ve talked to indicate the Fed is hell-bent on raising rates a fourth time in December, as the focus on the inflation mandate seems to be taking a priority over the growth mandate at this time. Over the last couple of meetings, the Fed suggested they're willing to let inflation move a little bit higher to allow it to become more favorable and in control, which means they won’t hike rates as quickly. But they also just said that they were going to hike rates faster. It makes forecasting difficult, because every time someone on the Fed utters a word, people rush to interpret and reinterpret it. Baird: So, as an investor, how would you prepare for the possibility of the yield curve inverting? If you are a retail municipal bond holder, generally you buy a municipal bond and you hold onto it until maturity. So long that the bond doesn’t default, it doesn't matter what interest rates do, because you're going to get paid out at par. My advice would be to stay high in quality and at least think about reducing higher-risk exposures. You've got to take what the market gives you. Laddering a portfolio with good credit quality is a time-honored strategy. Right now, with the possibility of increased volatility, holding better credits might be wise as well. Baird: You mentioned tariffs and trade wars. How could they influence the muni market? Trade wars and tariffs typically create some risk aversion, and when there is risk aversion, you have a demand for safe-haven assets like municipal bonds. Right. I’ve seen estimates that the United States has about $650 billion in possible exposure to tariffs. That will have a major impact on the market. Ultimately, slow economic growth is good for bonds and inflation is bad for bonds. In times of economic distress, though, investors often turn to bonds for shelter. 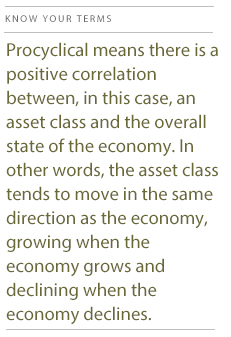 At the end of the day, munis are procyclical. As long as the economy continues to do well domestically, municipals should, in aggregate, follow suit. Baird: What are you watching for going forward? It’s hard to overstate the potential for volatility in the coming months. A new president in Mexico with left leanings. Concerns over energy pricing. All of the trade issues, especially with what's happening with NAFTA and China. What the European Central Bank does with asset purchases. Not to mention the U.S. midterm elections in November. Need I go on? Most forecasts I’ve seen are calling for economic activity to start to cool around the globe. Europe and China have definitely cooled, and are expected to continue to do so. Also, many forecasts are predicting the U.S. economy could slow down by 2019 to 2020 – they won’t necessarily turn negative, but they’ll likely slow from current levels. It’s something to keep an eye on.